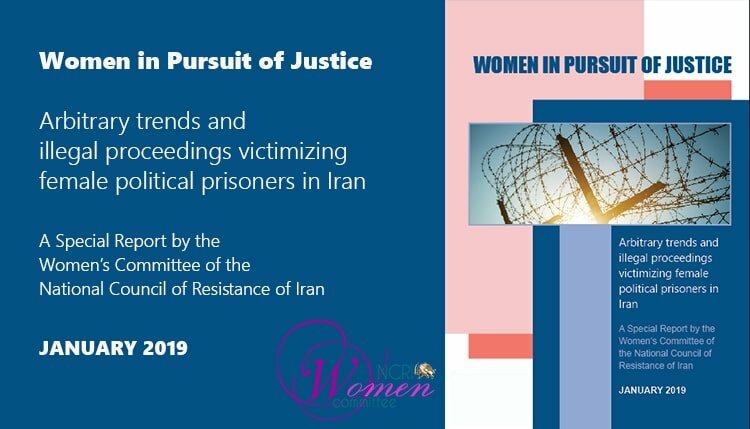 Women in Pursuit of Justice is a study by the Women’s Committee of the National Council of Resistance of Iran of the arbitrary trends and illegal proceedings victimizing female political prisoners in Iran. You can download the report here. Updated in January 2019, the second edition of Women in Pursuit of Justice aims to shed light on the systematic violations of women’s human rights in Iran in the process of arrest and imprisonment and hopes to receive support, attention and action by human rights advocates, lawyers, and relevant authorities from around the world. The Universal Declaration of Human Rights highlights the right to freedom of all human beings and specifically the freedom to proselytize their religion and thoughts. The International Covenant on Civil and Political Rights also states that no person shall be subjected to arbitrary arrest. In our study, Women in Pursuit of Justice, one can clearly see that these standards are far from the conduct of the Iranian regime. Iran is a country where women are not only imprisoned for murder, robbery and social crimes, but for demanding freedom, having different beliefs, drawing cartoons, writing a story against stoning or the death penalty, participating in peaceful protests, protesting against poverty and even for defending children’s rights. Read the full report, Women in Pursuit of Justice, in the Documents section of our website.